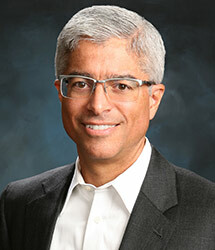 Pedro Pizarro is president and chief executive officer of Edison International, the parent company of Southern California Edison (SCE), one of the nation’s largest electric utilities. Edison International is also the parent company of Edison Energy Group, a portfolio of competitive businesses providing commercial and industrial customers with energy management and procurement services, as well as distributed solar generation. He is a member of Edison International’s board of directors. Pizarro served as president of SCE from October 2014 through May 2016, when he was elected president of Edison International. He was elected chief executive officer in October 2016. Previously, Pizarro was president of Edison Mission Energy (EME) and chaired its board of directors from 2011 until the sale of its assets to NRG Energy in April 2014. EME, a subsidiary of Edison International at the time, was an independent power producer that owned, leased, operated and sold energy and capacity from electric power generation facilities, and engaged in hedging and energy – trading activities in competitive power markets. Pizarro joined Edison International in 1999, moved to SCE in 2001, and progressed through several leadership roles prior to joining EME. Prior to his work at Edison International and SCE, Pizarro was a senior engagement manager with McKinsey & Company in Los Angeles providing management consulting services to energy, technology, engineering services, and banking clients. There, he developed corporate strategy, handled mergers and acquisitions, and oversaw operational and organizational engagements. Pizarro earned a Ph.D. in chemistry from Caltech and held National Science Foundation and Department of Defense graduate fellowships. He earned a bachelor’s degree in chemistry from Harvard University. Pizarro serves on the boards of Argonne National Laboratory, Electric Power Research Institute, Edison Electric Institute, and California Institute of Technology. He has also served on the boards of Electric Power Supply Association, California Power Exchange, Colburn School, House Research Institute, Southern California Leadership Council and Western Energy Institute.